"Steve, you're really going to go places," stated Les Paul after hearing Steve Miller play and sing. It was the legendary guitarist who taught the youngster some chords. Miller grew up in a musical environment. When his family lived in Dallas, Steve was permitted to miss school the day T-Bone Walker performed at their home. It was T-Bone who showed Miller how to play single-line guitar solos. In his teens, Steve went to Chicago to absorb the blues, to Manhattan for a spell and finally San Francisco where he formed the Steve Miller Band in 1967. 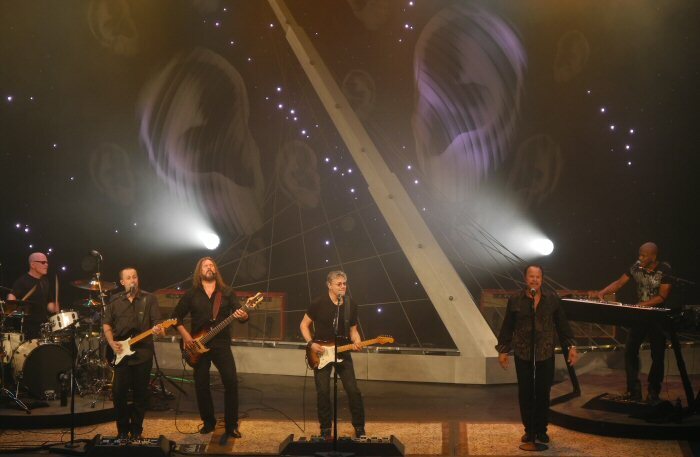 The Steve Miller Band on stage at the BergenPAC in 2012. Paul's prophecy was right as the Steve Miller Band (SMB) enjoyed much success in the 1970's with a string of hits including "The Joker," "Take The Money And Run," "Rock 'N Me," "Fly Like An Eagle," "Jet Airliner," "Jungle Love," and "Swingtown". In 1982, Steve scored another number one song with "Abracadabra," and his 1986 single, "I Want To Make the World Turn Around" (featuring a then unknown Kenny G. on saxophone) also did well. The SMB has been through many personal changes throughout the years but Steve is still well respected by colleagues and followers. After an eighteen year hiatus from recording, Steve Miller released Bingo and Let Your Hair Down in 2010. 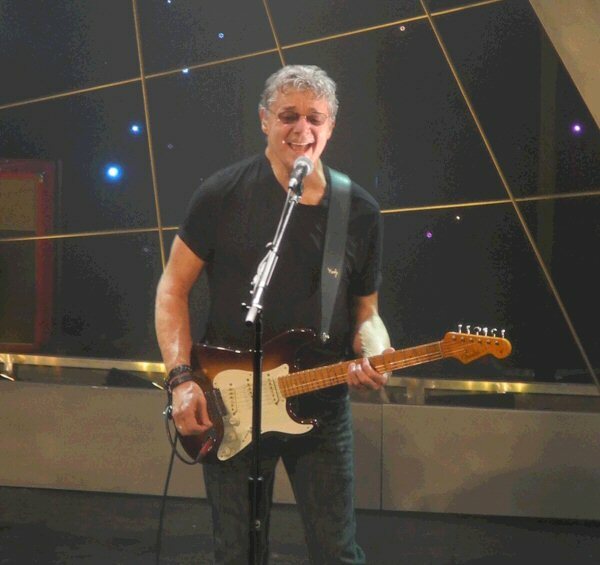 The Steve Miller Band has been actively touring in both 2011 and 2012. Soundpress.net caught up with the classic blues rockers on June 19, 2012 at the BergenPAC in Englewood, New Jersey. The laser like sounds from "Jungle Love" were heard as the curtain with a space cowboy revealed the six piece band. Bright colorful lights were blazing. The SMB galloped through their animated opener setting the pace for the next few songs that included "Take The Money And Run", the saucy "The Stake" and a magical "Abracadabra". A number of spellbinding guitar solos were mixed in among these fan favorites. The next four tracks were from the Bingo record and featured well-known covers such as "Further On Up The Road". This up-beat blues quartet allowed vocalist Sonny Charles to step up and shine. Sonny danced and stalked the stage as he sang the prose with passion. With Charles handling lead vox, Steve was able to focus and fly on his fret work. Steve Miller took care of much of the singing throughout the night with his band mates supporting and rounding out the sound. The group had good chemistry and delivered an energizing and engaging show. "You folks ready to sing? ", asked Miller. The crowd was and amply assisted with the funky "Ooh Poo Pah Doo". "I Want To Make The World Turn Around" went full circle from reflective to rocking with lights fanning out into the theater adding to the all around experience of the song. Cheers erupted as the opening notes of "Fly Like An Eagle" took off. The song soared and segued into "Nature Boy". "Living In The USA" was dedicated to the men and women in the armed forces. The use of red, white and blue lights enhanced the lively SMB classic. More people were on their feet clapping, dancing and singing as the group moved into a high flying "Jet Airliner" and a robust "Rock 'N Me". "Thank you Englewood you have been a great audience. This is the way you like to start the summer," enthused Steve Miller. They moved into their four hit encore adding a few twists and turns to keep it fresh and fun. Miller time in New Jersey was intoxicating with the SMB kicking off their summer tour on a high note! In addition to Steve Miller the BergenPAC's 2012 season continues to feature a diverse range of artists including Diana Krall, The Jacksons, Tesla, Yes with Procol Harem, Meat Loaf, Salt-n-Pepa, Pat Metheny, The B52's, Mickey Hart, k.d. Lang, Skid Row, and .38 Special. Please visit www.bergenpac.org for the BergenPAC's full 2012 line-up. Stevie "Guitar" Miller pulled out all the stops for the ecstatic Englewood audience.